Of the four illustrations, "Preparing Animals" focuses on activity within a kitchen. (See above, click to enlarge). The scene is intriguing in that it appears to take place in a domestic setting. It is also remarkable for featuring women at work. Labels call out the four Aristotelian elements; birds hanging from the rafters represent air, fish on a grilling rack represent water, a whole carcass on the spit represents earth and fire appears as itself in several locations. It is not unreasonable to suggest that this setting is none other than the Neri family kitchen and that the practitioners of the art are three of Antonio's siblings. In the middle right, a young boy is engaged in turning the spit (in green). The best candidate would be then eleven year-old Alessandro, the eventual heir to the family, whose own son named Neri would carry on the family practice as a physician. Of the two young women pictured, the three family choices are fourteen year-old Lucretia, Sixteen year-old Maria and twenty-six year-old Lessandra. 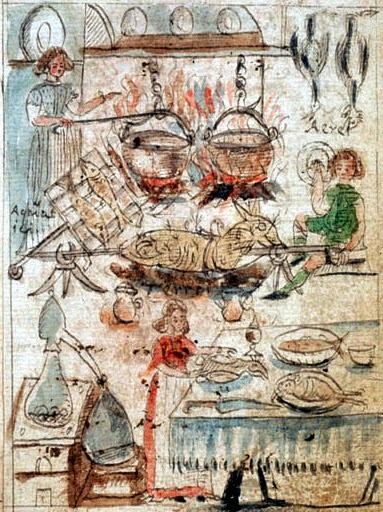 In addition to preparing finished meals, seventeenth century kitchens were busy making more basic ingredients also; preserves, distillations, special salts, herbal extracts and so forth. In addition to foods, medicinal and hygienic products were produced, like syrups and soaps. There is another strong connection between the kitchen and alchemy that lives on today: the methodology of cooking. 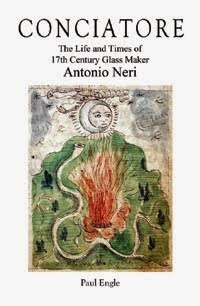 The process of combining raw ingredients and cooking them together, of experimentation and of iteratively refining a recipe to perfection, this is not so different from what Antonio Neri and his siblings were doing four hundred years ago.